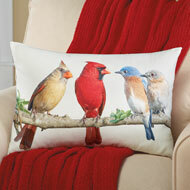 Birds on Branches Embroidered Accent Pillow Cover from Collections Etc. 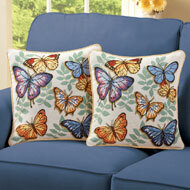 This lovely pillow cover is an easy way to add colorful style to your home. It features a cardinal, blue bird and goldfinch perched on leafy tree branches against a taupe background. The beautifully embroidered design stands out against the woven linen-like fabric. 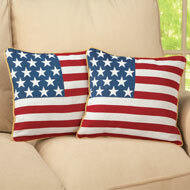 A zipper allows you to remove your 17" pillow form (not included) to machine wash the cover. Polyester; imported. 17" x 17". Bought pillow covers and table scarf. Love them very pretty and bright. Good quality reasonably priced. - Aunt V, Pearl River, La. Exactly what I expected and I love it. This pillow cover makes me happy. Colors and quality is good. 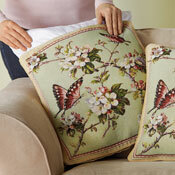 Set of 2 pillow covers feature a beautiful tapestry design on both sides. Zip open to insert 17" pillow form (not incl.). Cotton/ polyester; imported. Machine wash. Each: 17 3/4"Sq.